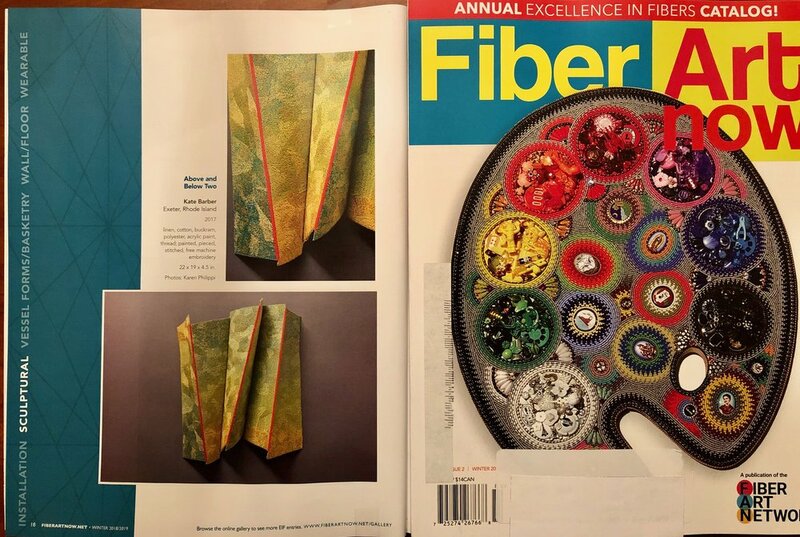 I’m so pleased to be included in the Winter 2018/2019 issue of Fiber Art Now magazine. My piece “Above and Below Two” was selected for this exhibition in print, which will travel to the Craft In America Gallery in Los Angeles in May 2019. “Red Slant”, a new piece made from scraps leftover from my machine embroidered sculpture, will be included in the exhibition Cut & Paste: Collage Today at the Jamestown Art Center in Rhode Island. If you’re around, come see the show from March 14 - April 20, 2019 . Better yet, come to the opening on Thursday, March 14th from 6-8pm. I'll have some small wearable pieces in this upcoming show at the Silk Weaving Studio in Vancouver. This exhibition is timed to coincide with the Textile Society of America conference which will be in town. Hope you can swing by if you're in the area! An invitational exhibit of 12 contemporary artists working in fiber will be at the Jamestown Arts Center in Rhode Island from March 9 - April 28. I've been working hard on producing something a little different for this show: freeform machine embroidered wall sculpture. This new work grows out of my recent fascination with woven pleats. I've continued working with folds, just on a somewhat larger scale. The piece pictured above is one in a series of three pieces, entitled "Above + Below" and measures roughly 20 x 20" x 5". I layered heavy linen and buckram fabric with acrylic paint and machine stitching to create a luminous surface. More pictures coming soon! This post is way overdue! I've been procrastinating about documenting my 2 week Studio Residency at Haystack Mountain School of Crafts and I'm finally getting around to it. Last spring (May 28 - June 9) I was fortunate to be one of 50 residents selected for the opportunity to play and create in any or all of the studios at Haystack . I went without a highly specific plan. I brought with me an open mind and the possibility of working at something I'd never done before. In the end, this was one of the most fun and creative two weeks I've spent, ever. And it all took place in a spectacularly mystical and beautiful place. Oh, and did I mention the lobster picnic on the rocks? Prior to this residency I'd been mulling over an idea for dipping textiles into porcelain slip and firing it with the intention of retaining the impression of the textile in a hardened, ceramic-like state. So, from textiles (where just about every loom was being used, mostly by first-time weavers), I wandered up to the ceramics studio, with a few little crocheted samples in hand, and did a few tests. As you can see from the photos below, I ended up dipping more than textiles in the slip, just to see what would happen. Of course, when fired, whatever was dipped simply burns away, leaving an extremely delicate (an often hollow) sort of exoskeleton behind. I like some of the results (maybe the beginning of a body of new work about "fragility"?! ), but learned that this process will take a lot more time, experimentation, and expertise in the ins and outs of ceramic slips, firing temperatures, and on and on. This is a story of a circuitous route to a new idea. 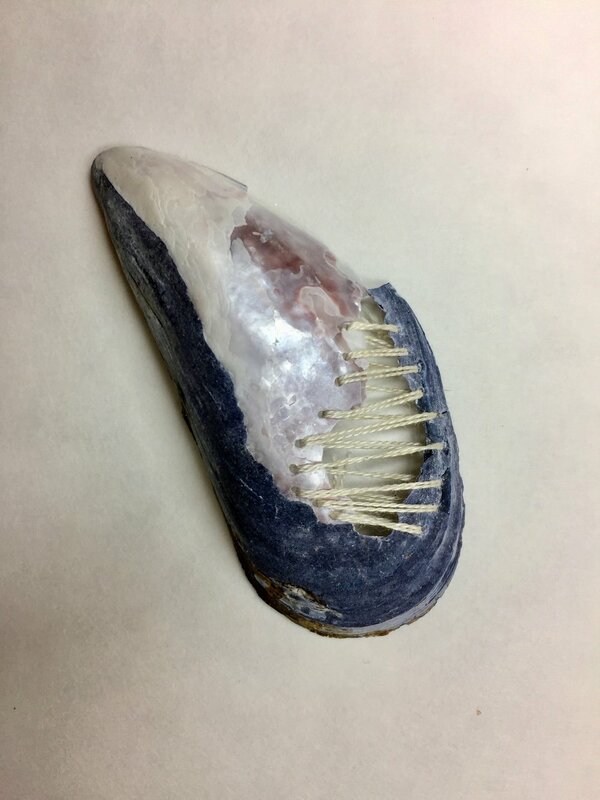 On one of my walks to the rocky shoreline below the Haystack campus I picked up a mussel shell that had a hole in it and needed mending. This brought me to the small metals/jewelry studio to see if there was a way I could pre drill tiny holes around the edges of the ragged hole in order to "mend" it with needle and thread without further cracking the delicate shell. After accomplishing this, as I was leaving the jewelry studio a box of copper scraps caught my eye. Hmmmm. Some of them looked like they could be mended too. More drilling. More stitching. At about this time I paid a visit to the print studio where another scrap box with giveaways attracted my attention. I left with what I later learned was a good-sized sheet of well-used blotting paper. 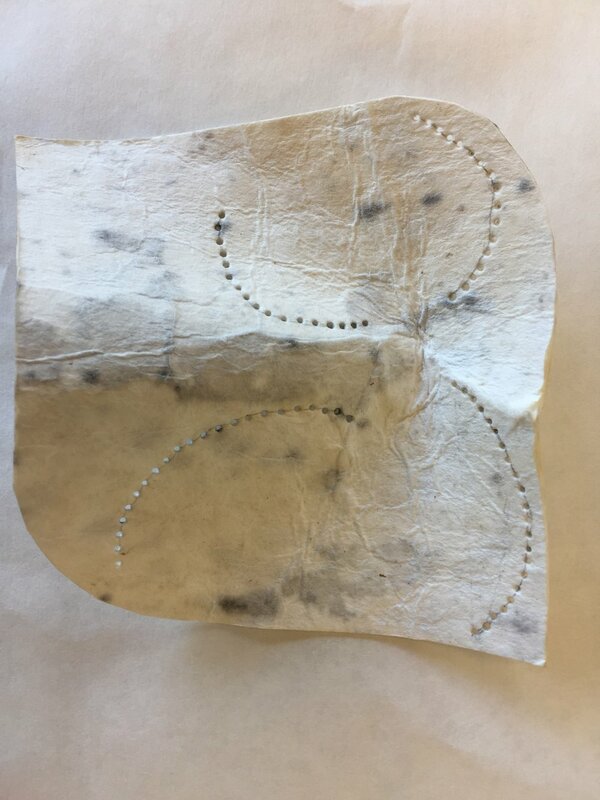 I began playing with cutting, wetting, and shaping the paper to see if I could make it somewhat "sculptural". To my great delight, this paper was up to the task. And, of course, being in a stitching frame of mind, once shaped, these little paper sculptures cried out to be stitched too.The pictures below tell the story. (Note: now, many months later, I find I am applying this idea to some new work - sculptural free machine embroidered pieces with hand stitching. More on that to come in a future blog). This was an unusually cold spring in Deer Isle and the lack of heat in the cabins and studios was beginning to wear thin. This brought me to the forge, one of the most stunning (and the warmest) studios at Haystack. I fell in love with everything about this place. The fire, the sculptural anvils, the array of hammers, and the patina of so many well-used tools. I went to the forge to see if I could scale up one of my little paper sculptures into something made out of steel. I wanted something solid, something with heft. Which meant it had to be steel. This was no small undertaking, and it was a test in determination. I spent the first day cutting my piece of steel and shaping it by hammering it cold over one of the anvils. That kept me really warm! By the middle of day 2, someone suggested that it really should be heated to make the hammering easier. Into the fire it went, and the work began to progress at a much more rapid pace. By the end of day three the piece was just about finished (and my arm and hand muscles were too). Oh, I forgot to mention that I had to use a hand drill to make all of those holes in the steel so I could "mend" it with a paper yarn that I plied by hand. And this is the end of my long-winded tale of my open studio residency at Haystack. The best part of all, of course, was the remarkable people I met-- residents and staff alike -- who made this a truly special experience. It was a privilege to be counted among them. Happy ending -- unexpectedly, I returned to Haystack later in the summer to take a workshop in fiber sculpture with Tanya Aguinigas. It was a LOT warmer. Garden clippings headed to the compost made a detour to my studio and look what happened. Wrapped with bits of dyed silk and linen, found lying about. This handwoven, pleated, machine embroidered "cocoon", originally intended to hang in space, landed on my head. Fits perfectly. An Easter bonnet perhaps?! In a departure from wearables, the Silk Weaving Studio is having this show of textiles for the home. 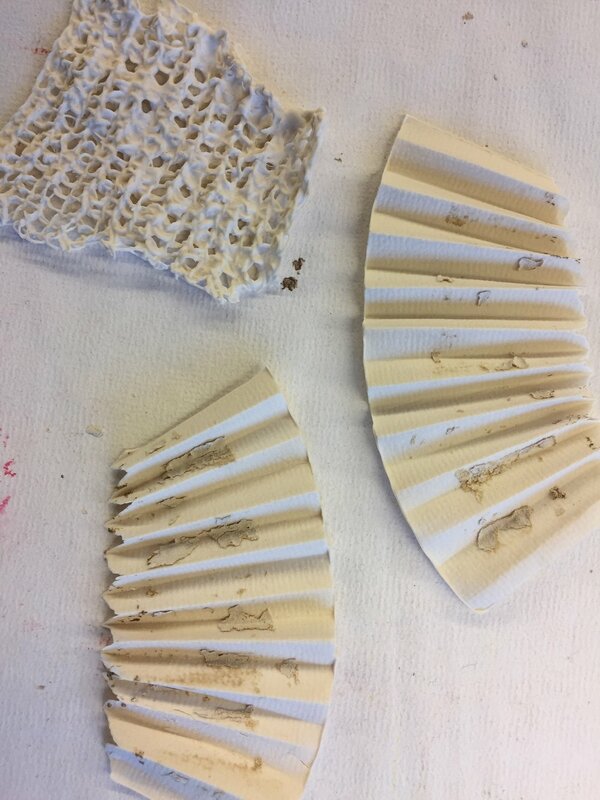 I'm putting the finishing touches on several 3-D pleated pieces before they are shipped off next week. The opening is on May 4th from 6-8 pm. Hope you can make it. I am thrilled -- just heard that I have been accepted into the Haystack Mountain School of Crafts Artist Residency for this spring. I intend to spend my two weeks there exploring, sampling and creating new woven, pleated textiles. In the company of other artists working in a variety of media, I know I will be inspired and invigorated. Last weekend I was able to catch a show called "Surface Appeal:Material Perception" at the Dedee Shattuck Gallery in Westport MA. I was immediately drawn to several small textiles on the far wall, created by Paula Stebbins Becker of RI. So interesting and lovely. Here's my favorite. "I deconstruct and unravel the [old] textile, then I re-weave the threads, combining them with the new threads, merging the old with the new and the past with the present...With each process of unraveling, reweaving and embellishing, a new generation of pattern and material is combined with the old. The textile embodies the mood and the spirit of the person or place found in the photograph while expressing subtle details..."
"Forward Folding" had a good run at the AS220 Reading Room. The opening was well attended and lots of fun, and several of my pieces have found new homes. Below are three links to articles about my show. The first is an interview I did for AS220 which gives some good insight into my work and process for "Forward Folding. The second is another interview and slide show put together by Origami Spirit, and the third a posting on World Shibori Network. Enjoy! I took the show down on Saturday, and am back in my studio working on ideas for my next series. I've been in hiding since the holidays, working towards my first solo exhibit, scheduled to open in July 2016. The show will be at The Reading Room, a Providence, RI gallery, one of several run by the forward-thinking AS220 arts organization. Working towards this goal has given me new focus and a good opportunity to develop a small body of work. I'm enjoying the concentrated effort, developing ideas slowly, and seeing the sometimes surprising turns my work takes. The working title of the exhibit is "Forward Folding". Most of the pieces in the show will be for the wall, although I also intend to make a few three-dimensional pieces. And undoubtedly I won't be able to resist throwing in a few wearable items as well. More to come! A few of my recent pleated pieces will be included in a show at The Silk Weaving Studio from Sept 11-24. The exhibit is called "Selected Innovations: The Inspiring Legacy of Junichi Arai". The show will also feature Nuno textiles from the Ann Sutton Collection. There will be lots of really interesting textiles in this show -- both old and new -- so don't miss it if you're in the area. I recently taught a wonderful group of women from the Connecticut Handweavers' Guild how to make silk scarves in the "itajime" technique. We folded and clamped silk scarves with shapes of wood and worked with indigo, marigold, cochineal, chestnut and iron to get lots of color variation. We were blessed with a perfect spring day, and I think everyone had fun and learned a lot. Here are several pictures from our day. 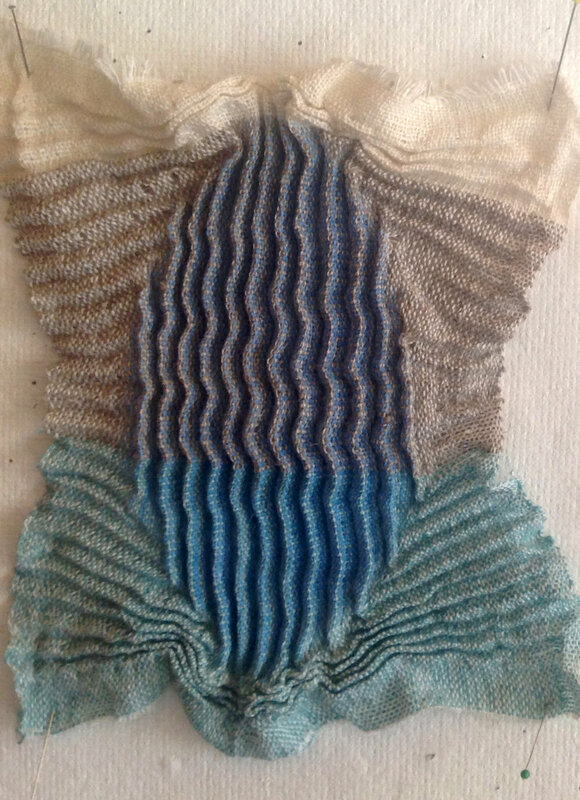 This 15" x 15" piece called "Storm" was recently in the Handweavers' Guild of Connecticut's Biennial show which ran for three weeks last month at the Lyman Allyn Art Museum in New London, CT. I wove a long and narrow warp shibori strip using a fine polyester warp and silk, polyester and linen weft. After I cinched up the pleats and steam set them, I cut the strip up and stitched sections back together. I love the way the tension pulls and distorts the lines of the pleats. This won the HGA Award of Excellence for fiber art and took first place in the "wall hangings" category. And here's another small piece, a sample using the same idea as "Storm" (above) but using a finer and softer warp. It has a soft enough drape that it could potentially work as something wearable. I've been working on a few new pieces for an exhibit at the Silk Weaving Studio in Vancouver. The show is entitled "Material+Culture" and features work inspired by the beautiful Sanjo Silk yarns. The scarves are woven with a fine and luscious silk/wool blend with floats of heavier silk/wool which I cut after washing and fulling to create little eyelashes one one side of the scarves. On the other side, little twill squares appear where the floats are tied down. I've also recently become quite addicted to crochet. Who knew! I love the repetitive hand movements and the fact that the crocheted piece can grow organically and spontaneously. The pieces for "Material+Culture" are made with white paper yarn and a stiff vine yarn. I started weaving this rug in February and it's finally finished and on the floor. It feels wonderful and thick underfoot. I love the Maori edge with darned ends for a rug finish. It's a little painstaking but makes a nice clean edge with no fringes. I'm already thinking of making variations on this design, using a smaller repeat and trying different colors. I may also try a slightly closer sett and a finer wool weft for a lighter/thinner rug. Here are a few other images showing what I've been up to in my studio the last couple of months. Not much rug weaving, but I am determined to get back to that as soon as I can. Mostly playing around with different ideas and getting a few finished scarves out there for sale.